I'm delivering a quick-fire Webinar this Wednesday on how to make impactful data graphics for communication and persuasion. Registration is free, at this link. In the meantime, I'm preparing a guest lecture for the Data Visualization class at Yeshiva University Sims School of Management. The goal of the lecture is to emphasize the importance of incorporating analytics into the data visualization process. Scott Klein's team at Propublica published a worthy news application, called "Hell and High Water" (link) I took some time taking in the experience. It's a project that needs room to breathe. The setting is Houston Texas, and the subject is what happens when the next big hurricane hits the region. The reference point was Hurricane Ike and Galveston in 2008. This image shows the depth of flooding at the height of the disaster in 2008. The app takes readers through multiple scenarios. This next image depicts what would happen (according to simulations) if something similar to Ike plus 15 percent stronger winds hits Galveston. This solution is estimated to cost about $3 billion. I am drawn to this project because the designers liberally use some things I praised in my summer talk at the Data Meets Viz conference in Germany. The design has a keen awareness of foreground/background issues. The map uses sparse static labels, indicating the most important landmarks. All other labels are hidden unless the reader hovers over specific words in the text. I think plotting population density would have been more impactful. With the current set of labels, the perspective is focused on business and institutional impact. I think there is a missed opportunity to highlight the human impact. This can be achieved by coding population density into the map colors. I believe the colors on the map currently represent terrain. This is a successful interactive project. The technical feats are impressive (read more about them here). A lot of research went into the articles; huge amounts of details are included in the maps. A narrative flow was carefully constructed, and the linkage between the text and the graphics is among the best I've seen. Old-timer Chris P. sent me to this Bloomberg article about Vanguard ETFs and low-cost funds (link). The article itself is interesting, and I will discuss it on the sister blog some time in the future. This table indeed presents the insight clearly. Those fund sectors in which Vanguard does not compete have much higher costs than the fund sectors in which Vanguard is a player. The author calls this the "Vanguard effect." This is a case where finding a visual design to beat this table is hard. For a certain type of audience, namely financial, the spreadsheet is like rice or pasta; you simply can't live without it. The Bloomberg spreadsheet does one better: the bands of blue contrast with the white cells, which neatly divides those funds into two groups. If you use spreadsheets a lot, you should definitely look into in-cell charts. Perhaps Tufte's sparkline is the most famous but use your imagination. I also wish vendors would support in-cell charts more eagerly. It's gratifying to live through the incredible rise of statistics as a discipline. In a recent report by the American Statistical Association (ASA), we learned that enrollment at all levels (bachelor, master and doctorate) has exploded in the last 5-10 years, as "Big Data" gather momentum. But my sense of pride takes a hit while looking at the charts that appear in the report. These graphs demonstrate again the hegemony of Excel defaults in the world of data visualization. Chart #5 (bottom right) catches the eye because it is the only chart with two lines instead of three. You then flip to the prior page to find the legend. The legend tells you the red line is Bachelor and the green line is PhD. That seems wrong, unless biostats departments do not give out Master degrees. This is confirmed by chart #2, where we find the blue line (Master) hugging zero. Presumably the designer removed the blue line from chart #5 because the low counts mean that it fluctuates wildly between 0 and 100 percent and so disrupts the visual design. But the designer forgets to tell readers why the blue line is missing. For biostatistics degrees, for which NCES started providing data specifically in 1992, master’s degrees track the overall increase from 2010– 2014 at 47%...The number of undergraduate degrees in biostatistics remains below 30. There is another mystery. Charts #2, #3, and #5, all dealing with biostats, have time starting from 1992, while Charts #1 and #4 starts from 1987. The charts aren't lined up in a way that would allow comparisons across time. Similarly, the vertical scale of each chart is different (aside from Charts #3 and #4). This design choice impairs comparison across charts. In the article, it is explained that 1992 was when the agency started collecting data about biostatistics degrees. Between 1987 and 1992, were there no biostatistics majors? were biostatistics majors lumped into the counts of statistics majors? It's hard to tell. While Excel is a powerful tool that has served our community well, its flexibility is often a source of errors. The remedy to this problem is to invest ample time in over-riding pretty much every default decision in the system. This chart, a reproduction of Chart #1 above, was entirely produced in Excel. On the sister blog, I wrote about Hans Rosling’s recent presentation in New York (link). I noted that Rosling has apparently simplified his visual palette. Rosling is best known as the developer of the Gapminder tool, used to visualize global social statistics data collected by national statistical agencies. I wrote favorably about this tool in a series of posts (link). Gapminder made popular the moving bubble chart, although not the only graphical form present. I’m particularly impressed by a simple sequence of charts in which Rosling explains the demographic changes the world is expecting to see in the next 50 to 100 years. This is an enhanced area chart. Each slice of area is subdivided into stick figures so that an axis for population counts becomes unnecessary. Instead, the reader sees two useful dimensions: region of the world, and age group. When Rosling showed the 2085 projection, we find that the entire rectangle has filled up, so the world population has definitely grown, roughly by 30 percent. The growth happens by filling up of adults; the total number of children has not changed. This is one of the key insights from recent demographic data. The first photo above shows something remarkable: the fertility rate in Asian countries has plunged to about the same level of developed countries already. This set of charts is unusually effective. It represents another level of simplification in visual means. At the same time, the message is sharpened. As I reported the other day (link), Rosling does not believe modern tools have improved data analysis. This talk which utilized simple tools is a good demonstration of his point. In case you don't see my other blog, the most recent post should have been posted here: The unkind fate of data graphics in the media. The Facebook data science team has put together a great course on EDA at Udacity. EDA stands for exploratory data analysis. It is the beginning of any data analysis when you have a pile of data (or datasets) and you need to get a feel for what you're looking at. It's when you develop some intuition about what sort of methodology would be appropriate to analyze the data. Not surprisingly, graphical methods form a big part of EDA. You will commonly see histograms, boxplots, and scatter plots. The scatterplot matrix (see my discussion of this) makes an appearance here as well. The course uses R and in particular, Hadley's ggplot package throughout. I highly recommend the course for anyone who wants to become an expert in ggplot. ggplot does use quite a bit of proprietary syntax. This EDA course offers a lot of instruction in coding. You do have to work hard, but you will learn a lot. By working hard, I mean reading supplementary materials, and doing the exercises throughout the course. As good instruction goes, they expect students to discover things, and do not feed you bullet points. While this course is not freeThis course is free, plus the quality of the instruction is heads and shoulders above other MOOCs out there. The course is designed from the ground up for online instruction, and it shows. If you have tried other online courses, you will immediately notice the difference in quality. For example, the people in these videos talk directly to you, and not a bunch of tuition-paying students in some remote classroom. Sign up before they get started at Udacity. Disclaimer: No one paid me to write this post. One of the dangers of "Big Data" is the temptation to get lost in the details. You become so absorbed in the peeling of the onion that you don't realize your tear glands have dried up. Hans Rosling linked to a visualization of tobacco use around the world from Twitter (link to original). The setup is quite nice for exploration. I'd call this a "tool" rather than a visual. Let's take a look at the concentric circles on the right. I appreciate the designer's concept -- the typical visualization of this type of data is looking at relative rates, which obscures the fact that China and India have far and away the most smokers even if their rates are middling (24% and 13% respectively). This circular chart is supposed to show the absolute distribution of smokers across so-called "super-regions" of the world. Unfortunately, the designer decided to pile on additional details. The concentric circles present a geography lesson, in effect. For example, high-income super-region is composed of high-income North America, Western Europe, high-income Asia Pacific, etc. and then high-income North America is composed of USA, Canada, etc. Notice something odd? The further out you go, the larger the circular segments but the smaller the amount of people they represent! There are more people in the super-region of high-income worldwide than in high-income North America and in turn, there are more people in the high-income North American region than in USA. But the size of the graphical elements is reversed. In principle, the "bumps"-like chart used to show the evolution of tobacco prevalence in individual countries make for a nice visual. In fact, Rosling marvelled that the global rate of consumption has fallen in recent years. However, I'm often irritated when the designer pays no attention to what not to show. There are probably well above 200 lines densely packed into this chart. It is almost for sure that over-plotting will cause some of these lines to literally never see the light of day. Try hovering over these lines and see for yourself. The same chart with say 10 judiciously chosen lines (countries or regions) provides the reader with a lot more profit. The discerning reader figures out that the best visual actually does not even show up on the dashboard. Go ahead, and click on the tab called "Data" on top of the page. You now see a presentation of each country's "data" by age group and by gender. This is where you can really come up with stories for what is going on in different countries. Bulgaria on the other hand shows a rather odd pattern. It is one of the few countries in the bumps chart that showed a climb in smoking rates, at least in the early 2000s. Here the data for men is broken down into age groups. This chart exposes a weakness of the underlying data. The error bars indicate to us that what is being plotted is not actual data but modeled data. The error bars here are enormous. With the average at about 40% to 50% for many age groups, the confidence interval is also 40% wide. Further, note that there were only three or four observations (purple dots) and curves are being fitted to these three or four dots, plus extrapolation outside the window of observation. The end result is that the apparent uplift in smoking in the early 2000s is probably a figment of the modeler's imagination. You'd want to understand if there are changes in methodologies around that time. As a responsible designer of data graphics, you should focus less on comprehensiveness and focus more on highlighting the good data. I'm a firm believer of "no data is better than bad data". One piece of advice I give for those wanting to get into data visualization is to trash the defaults (see the last part of this interview with me). Jon Schwabish, an economist with the government, gives a detailed example of how this is done in a guest blog on the Why Axis. Here are the highlights of his piece. He starts with a basic chart, published by the Bureau of Labor Statistics. You can see the hallmarks of the Excel chart using the Excel defaults. The blue, red, green color scheme is most telling. Just by making small changes, like using tints as opposed to different colors, using columns instead of bars, reordering the industry categories, and placing the legend text next to the columns, Schwabish made the chart more visually appealing and more effective. The final version uses lines instead of columns, which will outrage some readers. It is usually true that a grouped bar chart should be replaced by overlaid line charts, and this should not be limited to so-called discrete data. Schwabish included several bells and whistles. The three data points are not evenly spaced in time. The year-on-year difference is separately plotted as a bar chart on the same canvass. I'd consider using a line chart here as well... and lose the vertical axis since all the data are printed on the chart (or else, lose the data labels). This version is considerably cleaner than the original. I noticed that the first person to comment on the Why Axis post said that internal BLS readers resist more innovative charts, claiming "they don't understand it". This is always a consideration when departing from standard chart types. Another reader likes the "alphabetical order" (so to speak) of the industries. He raises another key consideration: who is your audience? If the chart is only intended for specialist readers who expect to find certain things in certain places, then the designer's freedom is curtailed. 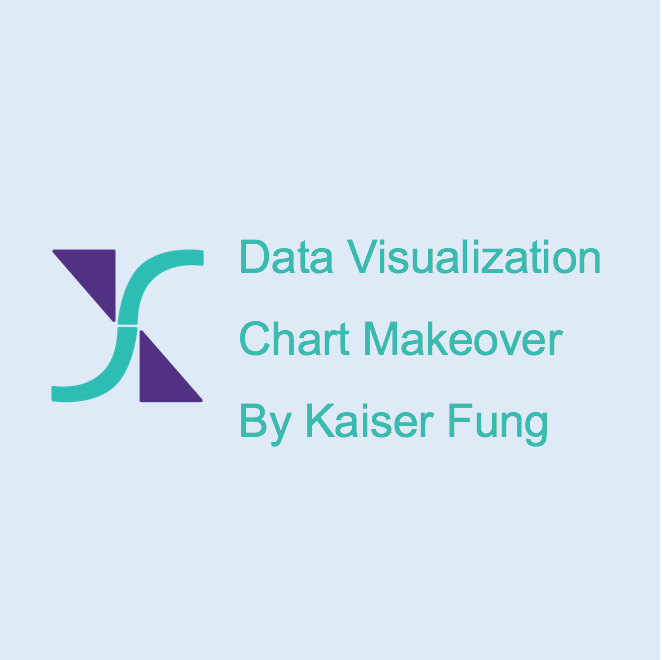 If the chart is used as a data store, then the designer might as well recuse him/herself.